JavaFX provides two transition classes that are designed to let you combine transitions so that two or more transitions run one after the other or at the same time. The SequentialTransition class lets you run several transitions one after the other, whereas the ParallelTransition class lets you run several transitions at once. When the play method is called, transition t1 will run until completion and then transition t2 will run. When t2 finishes, transition t3 will be run. To illustrate how transitions can be combined into a complete program, this listing shows a variation. This version of the program animates two balls traveling in opposite directions. A transition is created on the first ball to bounce it from left to right one third of the way down the scene. A transition is created for the second ball to animate it in the opposite direction two thirds of the way down the scene. Then, a ParallelTransition is used to animate both balls at the same time. The figure shows the program in action. 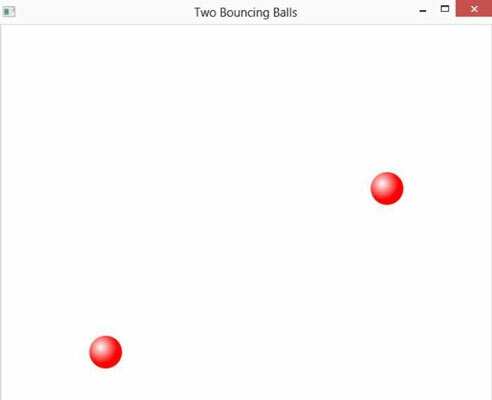 Bouncing two balls with JavaFX.